A CBC for dogs identifies and quantifies white blood cells, red blood cells and platelets in a given amount of blood. This includes analyzing the shape and condition of the cells for health and functionality. This information is helpful in learning more about your dog's immune system (white blood cells) and oxygen carrying capacity (red blood cell count). So when understood in this way, canine blood tests serve as very valuable tools in a veterinarian's toolkit for helping to detect, identify, diagnose and even treat illness or disease. 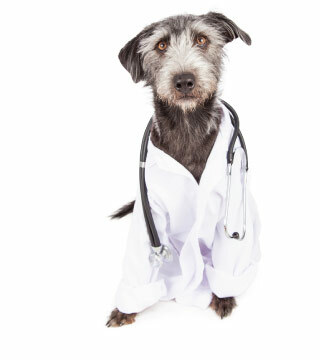 When Will A Veterinarian Recommend Dog Blood Tests? Cytology: We collect samples of sebum and cellular debris on the skin and in the ears to determine if infection is present. In addition, we may perform needle or core biopsy of lumps or masses on your dog's body to look for cancer cells. We recommend discussing lab tests for dogs with your veterinarian, in order to make an informed decision as to whether or not your canine friend can benefit from dog blood work. In addition to having veterinary staff on duty around-the-clock to handle pet health emergencies, Bergheim Pet Hospital & Clinic also has its own in-house laboratory. Although this means we can process all kinds of lab work for dogs quickly and reliably, it is in emergency situations, when time is of the essence, our in-house dog laboratory is most helpful. After all, if we can draw, process and analyze dog blood work on the premises, then we can have the results we need immediately. This increases the chances that we can determine what the issue is, and then implement a successful medical intervention based on the results. In this way, our dog laboratory allows us to be a proactive and timely partner in your dog's health and care. Understanding dog blood tests is second nature to us. However, we understand that the same might not be said for you. This is why we always fully explain the results of canine blood tests with a patient's human caretakers. After all, arresting and treating whatever a blood test indicates takes an informed and concerted team effort. If we are ordering dog blood work, it will most likely be in the form of a Complete Blood Count, or else a Blood Chemistry (serum) test. Blood Chemistries, or blood serum tests, evaluate a dog's organ function, electrolyte status, hormone levels and more. These tests are important to evaluating the health of older dogs, dogs with signs of vomiting, diarrhea or toxin exposure, as well as dogs receiving long-term medications and general health before anesthesia. In order to determine which dog blood tests can best benefit your canine friend, we recommend scheduling an appointment with your veterinarian today.